Poplar Healthcare » Anami Patel, Ph.D.
Dr. Anami Patel received his Ph.D in Microbiology and postdoctoral fellowship at University of Maryland, Baltimore, MD. 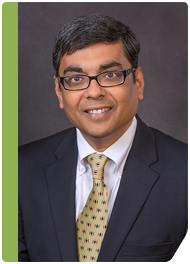 Dr. Patel received his Clinical Molecular Pathology training at St. Jude Children’s Hospital in Memphis, TN. In 2002 he started the Molecular Diagnostics Clinical Service at LeBonheur Methodist Hospital in Memphis, TN where he served as Technical Director for past 14 years. Dr. Patel received a Clinical Molecular Biology & Diplomat in Laboratory Management from ASCP. He is a member of the Association of Molecular Pathology, American Society of Microbiology, and is a College of American Pathology inspection team leader. Dr. Patel serves as a reviewer for several scientific journals and has published more than 20 papers in leading journals. He has presented more than 40 papers at national and international scientific meetings. He has been principal investigator for more than 20 diagnostic clinical trials involving molecular diagnostic assays and co-principal investigator in numerous CDC funded research projects.